Good golly, Winter is almost here, and I’m still trying to enjoy what’s left of Fall! Most of the season was spent making sure my dear ol’ Dad was taken care of. He had surgery back in October and is currently recuperating in rehab. The almost daily trips to his house keeping up with his mail and bills as well as my everyday life knocks me out in the evenings! 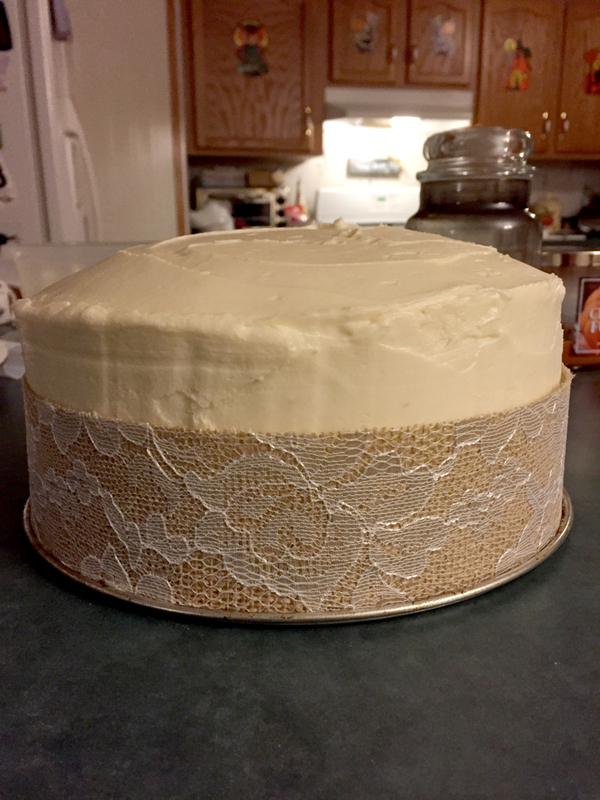 But in between all that, I have accomplished a baking milestone…I made a wedding cake!!! A 2-tiered cake!! I am really proud of myself!! A friend of mine asked me months ago if I could make her wedding cake for her rustic fall-themed wedding; I was super-excited to take up the challenge in making a multiple-tiered cake! 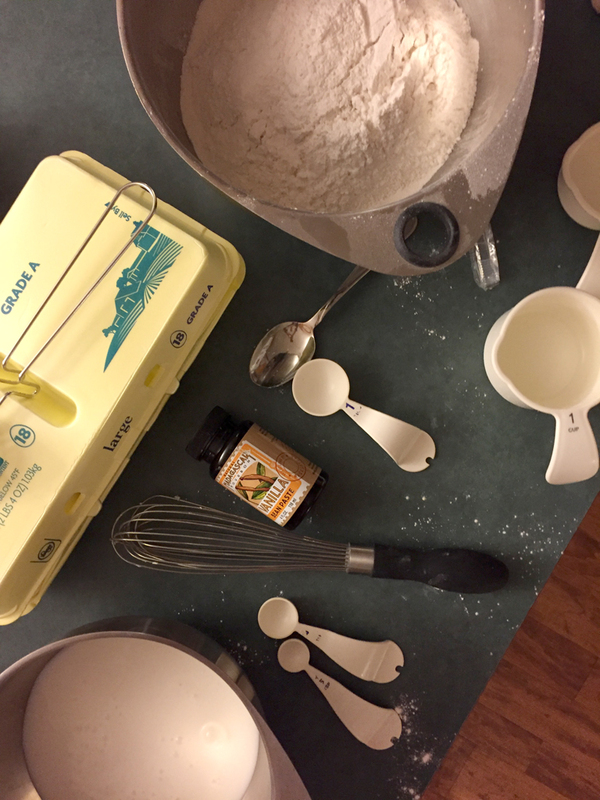 She showed me a picture and I did a lot of studying and searching for other similar cakes with links that provide info on how the cake was made, and then I shopped for the supplies. 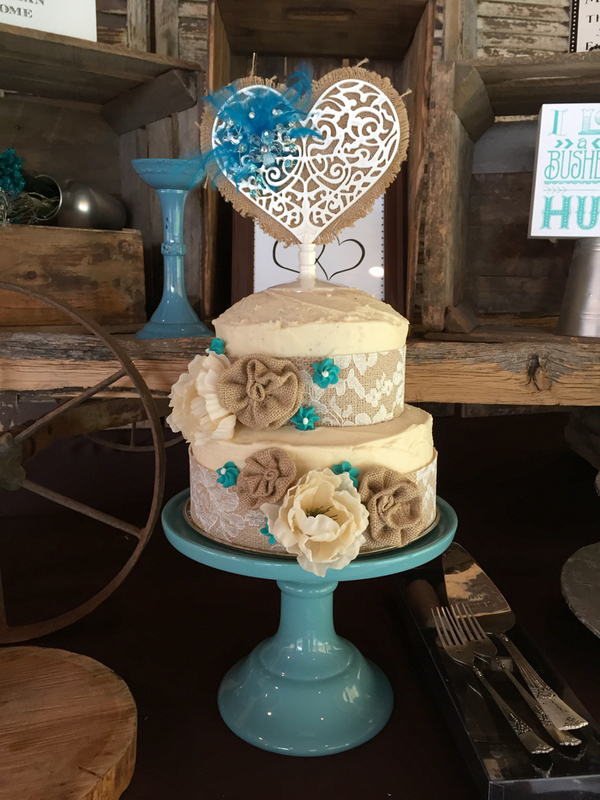 It was made with two flavors: vanilla and devil’s food cake, with a raspberry filling in between each layer, topped with buttercream frosting and burlap decorations. 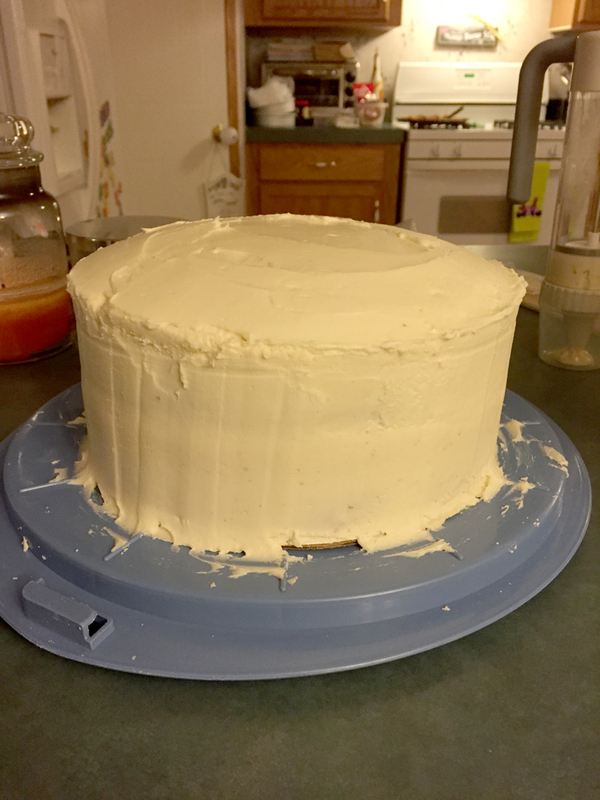 Because of its size, I was able to use just a single dowel rod in the center of the cake, with just a bit of it punched into the top tier to hold it in place. 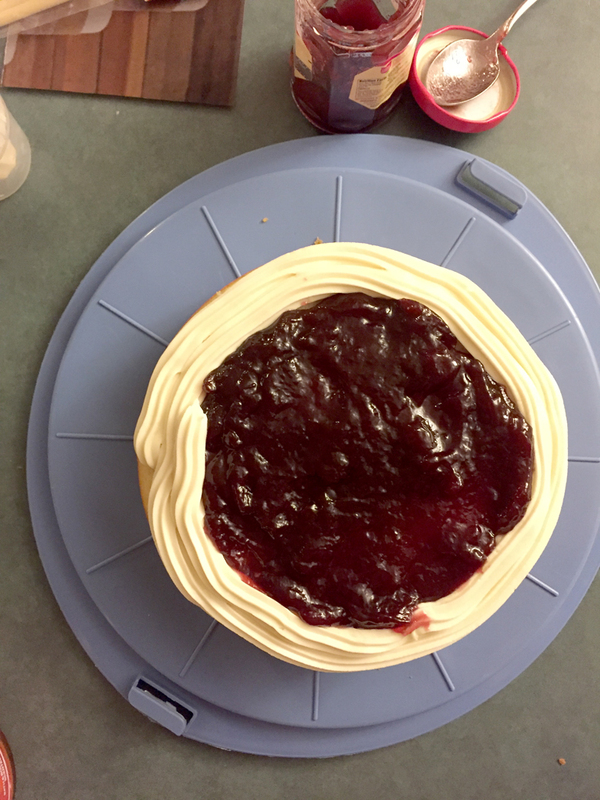 Both tiers were divided with a 6-inch cake board for easier disassembly. 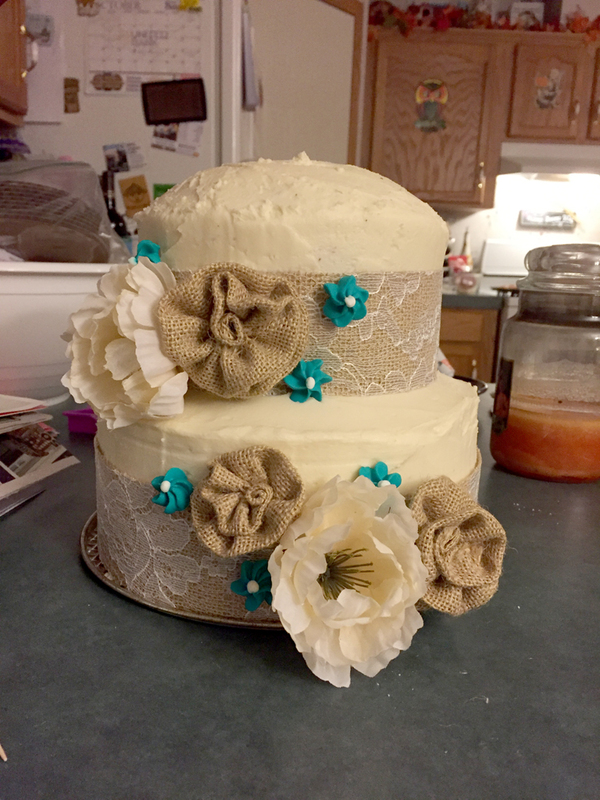 For the burlap/lace ribbon, I attached wax paper on the back of it with double-sided tape to keep the ribbon from making contact with the frosting. 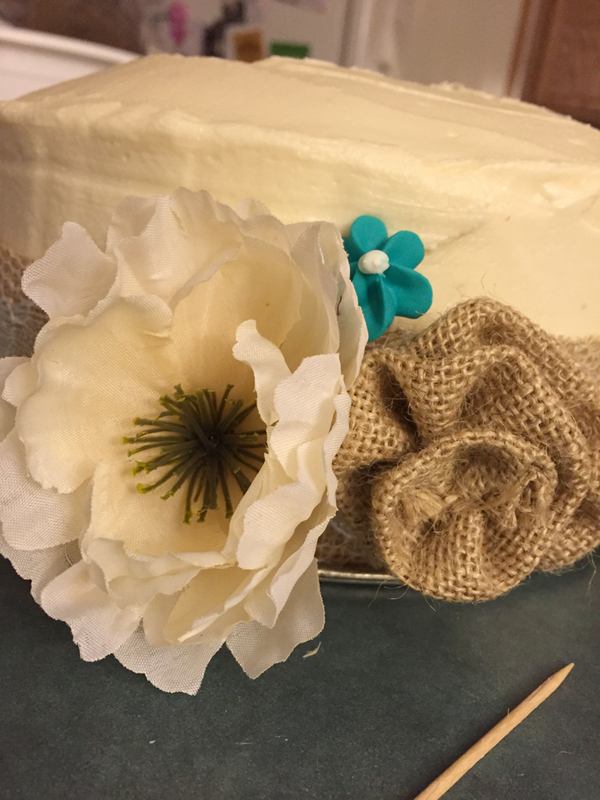 The burlap flowers were being held by toothpicks. Originally I was glueing the backs of the ribbon with pieces of cake board and I used a dab of royal frosting as a glue to hold a toothpick in place like a stem. That didn’t work, so I simply poked a toothpick through the burlap flowers and that worked! The white artificial flowers had their stems so I easily poked them through the cake. 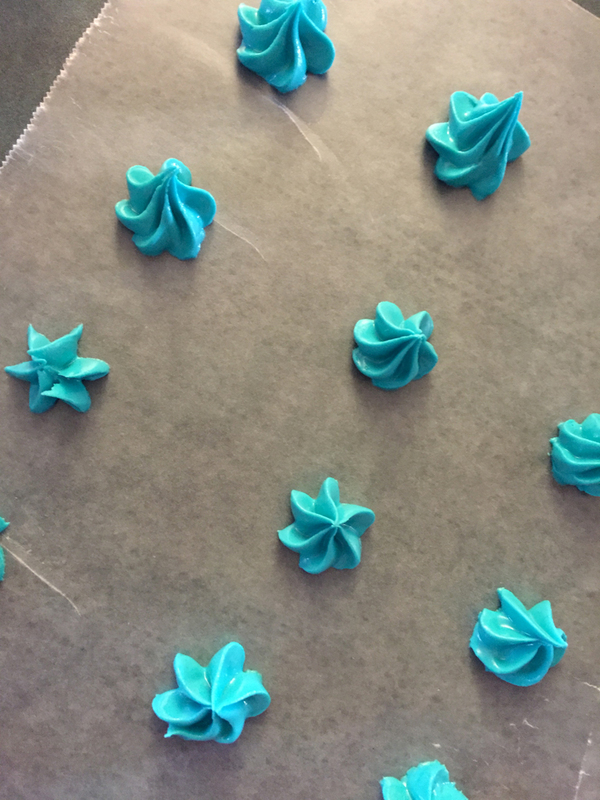 The blue flowers were made with royal frosting with a #2D Wilton frosting tip. Getting it to the reception site was actually less stressful than I anticipated! 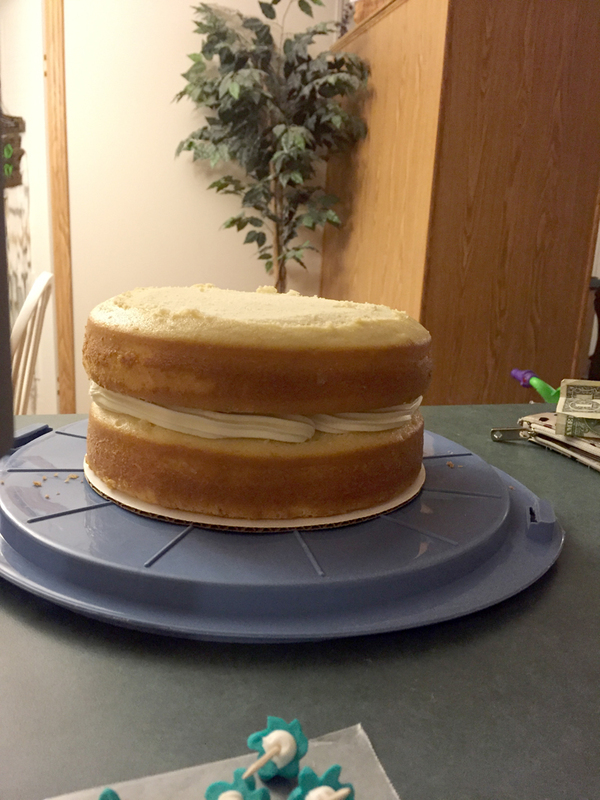 I used the bottom of my springform pan as the cake’s base so I could transfer it into a deep dish pie plate big enough for the cake to sit in it, then I placed it in a box. It survived the trip, and I didn’t become a cake mess! I found the cake stand locally, and it was a wedding gift. 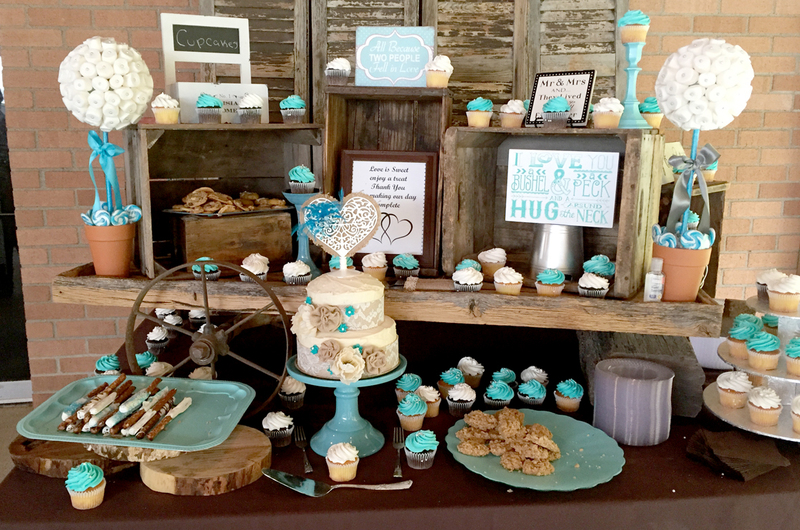 The guests had cupcakes and the cake was only for the bride and groom. To make a long story short, the cupcakes didn’t make it to the party. 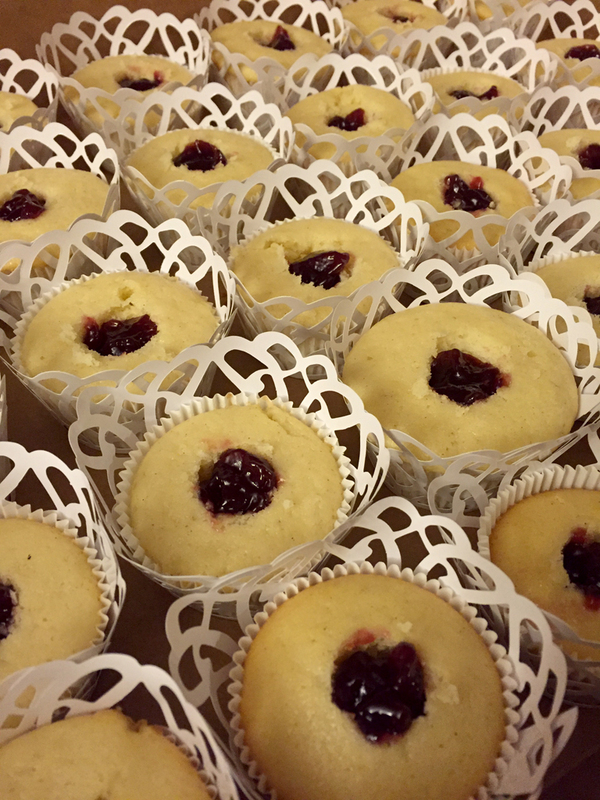 Using the same recipes, they were placed in the fridge to keep cool and fresh for the big day, but the night before they got dry and the frosting was falling off of them. 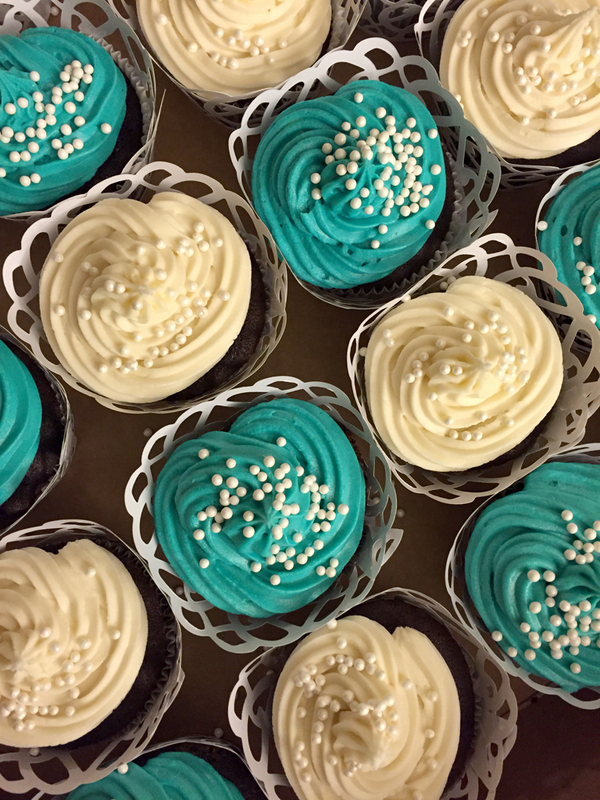 A big order of store-bought cupcakes came to the rescue. Sooooo, here’s a rule of thumb: if you plan to make multiple cupcakes ahead of time (which I did) make sure you FREEZE them and have room for them (which I don’t), and don’t decorate them until they are thawed and ready to go (which I didn’t). Refrigerating them can make them drier as opposed to freezing them. 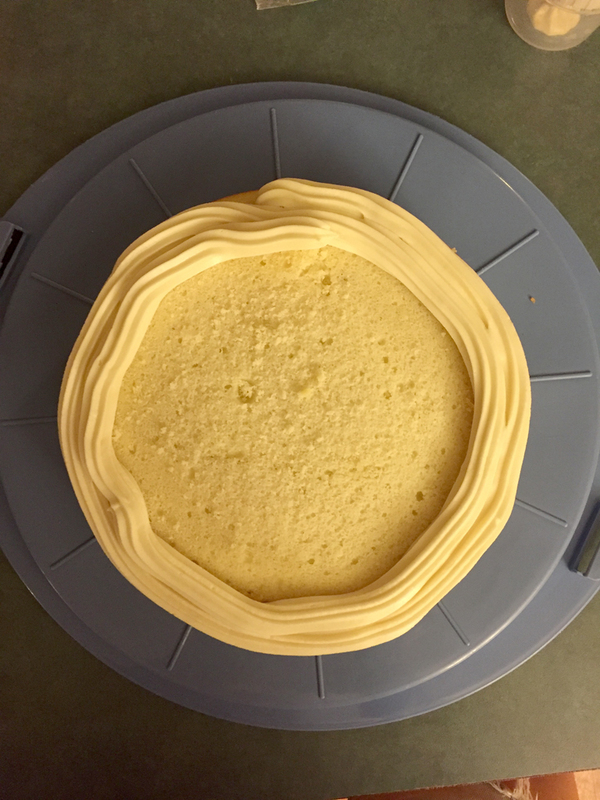 I froze the cake before decorating and assembly, and it turned out fine. Lesson learned! The fancy cupcake liners were ordered from here. In other news, I’ve been catching up on the holiday baking. Usually I begin in August, but time was definitely not on my side this year. 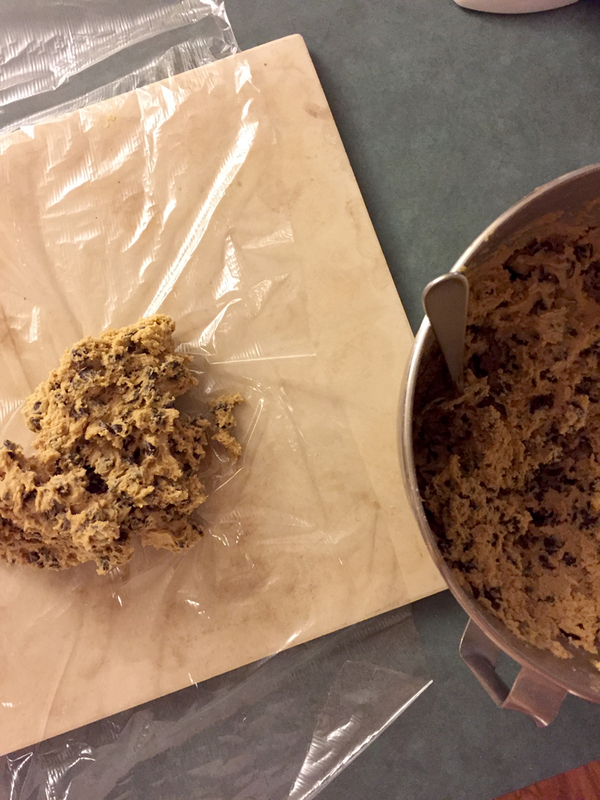 I’ve been making cookie dough and freezing it ahead of time. I’m going to reserve a weekend where I will thaw out the dough and bake everything. It’s something I never did, and it seems like a good idea for me to start doing now since I’ve been busy as of late. 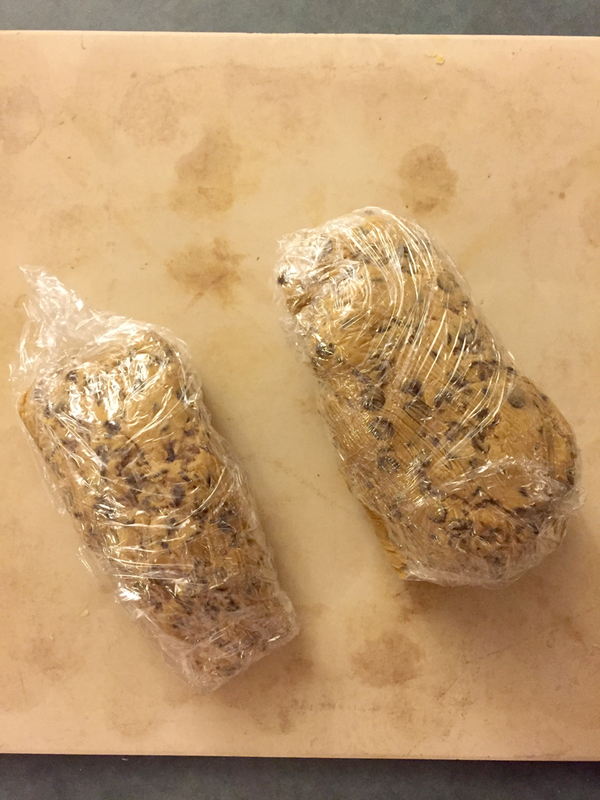 I simply just took the dough of whatever cookie I was making, placed gobs of it on a long piece of plastic wrap, and carefully rolled it up, then I placed them in freezer bags and labeled them. I would suggest 3 months as the latest in keeping your dough in the freezer. Then when the time comes, I’ll let the dough thaw overnight in the fridge, then I’ll place it in a large bowl for maybe an hour or so to reach room temperature, then bake. So on with winter, and my birthday!! Oh yeah, another year older, and I’m very thankful to live for another year! 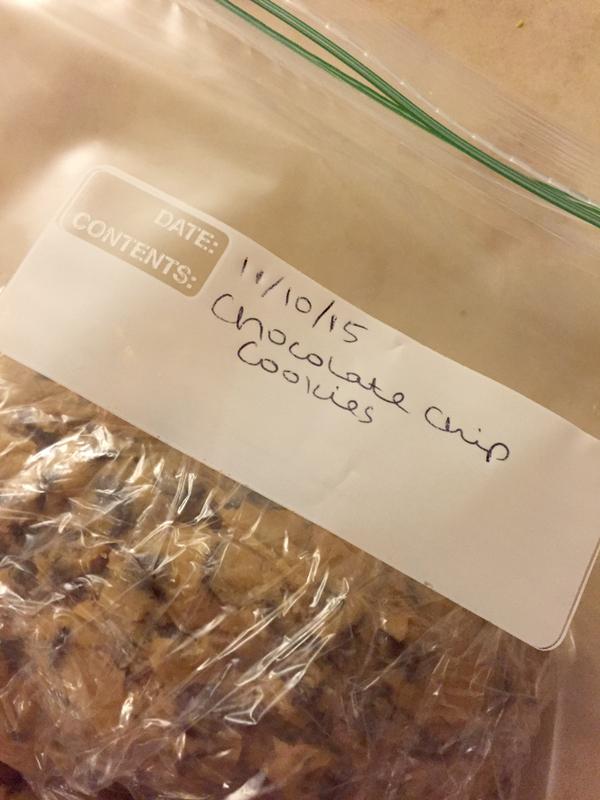 I’ll be celebrating with the husband and the tot, and do some shopping, and bake some more! Until next time, happy baking!! Congrats on the wedding cake! Definitely a challenge for many a baker! The cake looks pretty. Gabby and I have done some Xmas baking so far – choccy chip and PB cookies. More will be coming. She’s doing the decorating this time.